From November 17 to November 29, the world turn its attention to Sharm El Sheikh in Egypt for the Convention on Biological Diversity - COP 14; the fourteenth Conference of the Parties of the United Nations to the Convention on Biological Diversity. In October 2018 WWF published its Living Planet Report. This report reveals that at the global level, nature continues to degrade, with devastating effects for wildlife and the planet. Global populations of fish, birds, mammals, amphibians and reptiles have decreased by an average of 60% between 1970 and 2014. If concrete actions are not taken, we are at risk of losing everything! The loss of nature continues tirelessly and the Aichi targets will not be achieved by 2020. The CBD COP 14 will lead to the development of a New Deal for Nature, where Governments will agree on new goals for biodiversity for the next 10 years. Their disappearance is accelerated by our irrevocable destructive practices. The bushfires in Madagascar burned 510,000 ha of forests in 2017 according to the Global Forest Watch, which is more than 55 times the surface areo of the city of Antananarivo ... However, Nature and all the wealth of our country, our animals, our plants and our ecosystems have an inestimable environmental value. In 2016 for instance, tourism - which is mainly based on the unique nature of Madagascar - helped to support 641,500 jobs and brought Ariary 4.369,2 billion to the economy. WWF strongly supports the call for a new deal for nature and people. By 2020, in just two years, we need an agreed roadmap that recognizes the intrinsic link between the health of nature, the well-being of people and the future of our planet. 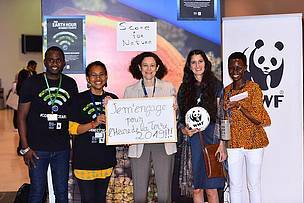 WWF expects that the CBD COP14 ends with a strong roadmap supported at the highest political level and proposing an ambitious new deal for nature and people in China in 2020. We need this new pact that protects and restores nature, for a common sustainable future. During this election period, we call on the future president and his government to make a firm and genuine commitment in favor of the richness and unique biodiversity of Madagascar.